Focused on Issues Vital to Dental Professionals Today, and Tomorrow. There has been a lot of focus on the importance of creating the electronic or digital office and today more dental practices than ever have embraced the benefits of digital records and computerized billing. But key to the creation of a true “Electronic Practice” is the creation of Electronic Medical Records (EMR) that flow seamlessly into a patient’s overall Electronic Health Record (EHR) - something healthcare providers are hearing a lot about these days. Recognizing the trend as far back as 1999, The Complete Exam® (TCE) was conceived from the ground up by experienced dental and legal professionals committed to creating true, electronic medical records for your dental practice patients. Currently ignored or inadequately addressed by virtually every other dental software company, TCE remains the only dental practice management software solution available that comprehensively addresses ALL of the clinician’s needs – including the creation of a robust EMR. 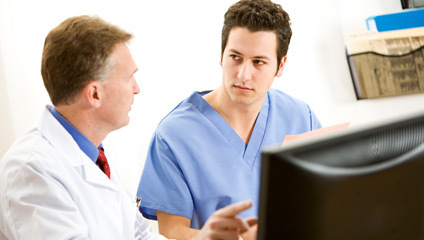 The EMR is the critical component practices will need as they prepare to meet developing EHR mandates. The Complete Exam’s clinical and administrative charting functions look and work like paper charts, are user-friendly, integrate with digital imaging programs and other practice products, and are fully compliant with all HIPAA Privacy and medical-legal requirements. This web page was last updated on Tuesday, February 27, 2018.